One of America's favorite writers, Karen Kingsbury, shares with you 40 of her favorite true miracle stories in which people experience God's intervention and loving touch in their lives in her book, A Treasury of Miracles, True Stories of God's Presence Today. Each tale will fill you with lasting joy and wrap you in the assurance of knowing God is with you. As a FREE gift to all that order the Hardcover edition, Guideposts will include 4 beautiful full-color Note Cards with your order. KAREN KINGSBURY shares over forty real-life stories about people whose lives were changed by something mysterious and wonderful. • Meet a mother whose choice to release control to God saves her son, after an accident with a moving truck leaves his life in unimaginable danger. • Find out what happens when two strangers come together under incredible circumstances, each offering exactly what the other needs. • See the reunion in the most unlikely of places between a mother and a child she gave up for adoption more than twenty years earlier. • Watch as a woman receives the greatest Christmas present—the treasure she thought was gone forever, lost on a long-ago fishing trip. With each of these stories, Kingsbury shares undeniable proof of God’s presence in our lives, reminding us of His faithful love, stead-fast protection, and profound strength to do more than we could ever imagine. 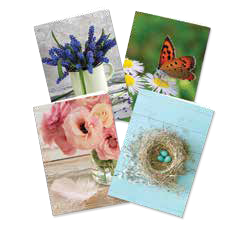 Get these beautiful note cards FREE with your purchase of the print edition! The New York Times best-selling author Karen Kingsbury is America’s favorite inspirational storyteller with more than twenty- five million copies of her books in print, some of which have been made into Hallmark movies. She speaks to over one hundred thousand women annually. Kingsbury and her husband, Don, have one daughter and five sons and live in Nashville, Tennessee.